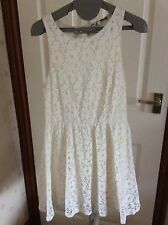 New Look Size 10 Womens Dress Dungarees Denim Summer Holiday Party Fesitval . Condition is Used but in great condition. Dispatched with Royal Mail 2nd Class. Karen Millen Military Shirt Dress. NOT LINED.Fastenes with popper buttons through and beaded on the shoulder. Lovely dress for all occasions, from morning to evening out. Sleeveless blouse made ​​of thin material in a washed denim look. With a casual knot at the centre front that can be tied from the long ends of the button bar. Fitted shape. Pointed collar. Two chest pockets with flap and button. DESIGNED BY ISA ARFEN. MIDI SHIRT DRESS.